The Internet started as an anything-goes place for design expression, a place where web designers could try out flavors of communication, then evolve useability standards in unique ways. Throughout the 1980s and 1990s there was a sense of progression both organic and accepting. Failure was measured in terms of not trying. There were no standards, so that web designers could try anything. Today, the commodity that is web design has turned against experimental design in favor of prefabricated templates based on compatibility with Drupal, Joomla and WordPress. Too often, “good design” is based on the generic website design: Social media icons, search box, menu, slider, blog section and footers. We web designers should celebrate the innovators who break with standards and innovate interface. During the peak of the nylon era, the Internet was a network of primitive university and government servers hosting mostly static HTML pages. Design involved blinking buttons embedded in bordered tables displaying shouting fonts – WELCOME TO OUR HOMEPAGE! Pages had wallpapered backgrounds as bellicose as your Aunt Bertha’s muumu, with animated GIFs scattered about as if a child had been asked to decorate a newly stretched canvas with Rainbow Bright stickers and metallic paint pen. Nonetheless, the public was pleased with the novelty of having their computers dial into a directory of thousands of destinations. The quaint community of interconnected websites felt like a bad holiday light show sponsored by a Las Vegas casino. Web design was clearly in the midst of adolescence, pimpled and awkward, but marching wistfully toward design standards. Meanwhile, web interface design was being born. Because burgeoning webmasters made do with common sense HTML tagging in programs like Note Pad, early desig was a manual and calculating procedure. Their technological demands lacked WYSIWYG editors to streamline processes, so painting websites by numbers wasn’t an option. Recycling code propagated the designs – and their flaws. The early Internet websites were primitive but utilitarian, and as the millennium approached, the manual process of website construction had empowered a generation of webmasters with sufficient tools in their kits for building and understanding all aspects of web construction, from design to utility. Cyber etiquette and digital manners among participants became popular in the 1990s, so-called netiquette a civilizing pressure for evolving new design standards and uniform user behaviors for the betterment of user communities. Frames were forsaken along with background midis and other nonsensical fluff. A provincial assortment of novelty websites and the cascade of media publications and big businesses eager to for online acceptance became case studies in better design standards and etiquette. 1990s websites demonstrate an eclectic number of design styles disproportionate with their overall numbers. Wildly creative but not always failing. Literal designs were popular with large image maps with a “where’s Waldo” approach to hyperlinking. Southwest Airlines, for instance, displayed a desk where users would click on a illustrated phone to make reservations, above a desk where books could be clicked to see flight schedules or to research their frequent flier program. 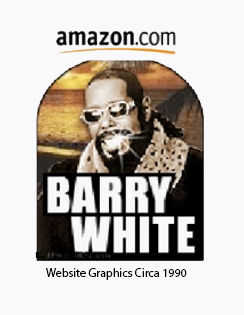 While the Amazon’s 90s website design is eerily similar to their current website, their borderline racist and blinged out graphics (i.e., Barry White pictures) were quickly erased into memory. The US Army Corps of Engineers 1990s website is a downright disaster. All were torchbearers for usability case studies, and all were designed by raw code. Browser compatibility forced programmers and designers to work within defined limits, but their expression was largely singular, with custom programs, designs and overall expression something that couldn’t be purchased en masse. Web templates be damned. We wish there was a difference in web design during the past 10 years, but have found that the standards are anything but different from ten years ago. But we don’t despair, for there are great examples of innovative and original web design – many even have generic CMS built into them. Who says you can’t have it all?